Using RNA sequencing (RNA-seq) data and Artificial Intelligence are both a necessity and an opportunity to develop therapeutics that target splicing errors. The use of machine learning enables us to discover new splicing errors and quickly design therapeutic compounds to correct them. SpliceCore is our dedicated AI platform for RNA therapeutics discovery. 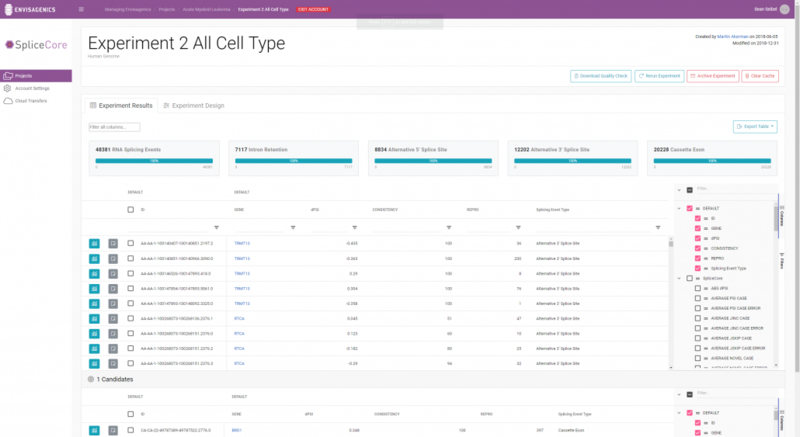 We developed this technology platform specifically for the analysis of RNA sequencing data. It can identify, test and validate hypothetical drug targets faster than traditional methods. At the heart of SpliceCore is our proprietary database of more than 5 million potential RNA splicing errors. It is the largest database of splicing errors in the world and it is used to test every RNA sequencing dataset that is input for analysis. Scalable cloud computing enables us to process massive amounts of RNA sequencing data efficiently, at higher speed and lower cost, exponentially accelerating therapeutic innovation. By integrating data from hundreds of patients we maximize therapeutic impact of our drug design, while maintaining high standards of statistical significance and reproducibility. SpliceCore transforms massive amounts of RNA sequencing data into the raw material needed to power its therapeutics discovery engine. To identify RNA splicing errors that are likely to cause disease. To predict binding and sequence of RNA therapeutic compounds capable of reverting the identified splicing errors. Prioritizing RNA splicing errors that are biologically relevant to a disease and is druggable, significantly accelerates and reduces risk and cost of drug development. Patient RNA sequencing datasets are securely uploaded to the cloud for analysis. SpliceCore maps your datasets to more than 5 million RNA splicing errors in our database to identify disease causing splicing errors. Results are produced rapidly and made available for additional exploration with experimentation tools to uncover statistically significant differences between case and control datasets. Machine learning algorithms prioritizes splicing events that biologically impact gene function and may potentially be a disease driver. Additional machine learning algorithms identify druggable splicing events based on their controllability by antisense RNA drugs. Artificial intelligence identifies unique and novel RNA therapeutics that target biologically relevant genes.